Kim Adams joins Entercom's WDZH-FM (987 The Breeze) Detroit as its new midday host, weekdays from 10am-3pm. Adams is a veteran broadcast personality with over 20 years of on-air television experience as a meteorologist for WDIV-TV in Detroit, WXYZ-TV in Southfield, MI and WBNS-TV in Columbus, OH. 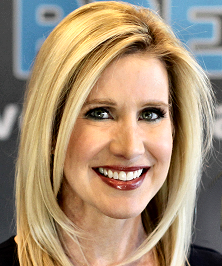 "Kim Adams is an award-winning television personality and one of metro Detroit's most recognizable faces," said Entercom Detroit Senior VP/Market Manager Debbie Kenyon. "We're excited to welcome Kim to our team and know she'll help our listeners breeze through their day." "I'm grateful for this opportunity to host the midday show on 987 The Breeze and excited to transition from television to radio," added Adams. "Radio enables live dialogue between hosts and listeners and I'm looking forward to connecting with the Motor City every weekday."